Lost Windows Vista login password? Many people may know that it is easy to gain a user account password when you have another administrator account. Each of these accounts can be "administrative" account, with administrative accounts having unlimited access to the computer and you can easy reset other user account password in control panel. However what if you have only one administrator account and forgot its password, this problem maybe getting more complex. This article will show you a universal method to hack a Windows Vista administrator password. You don't need to reinstall the system or lose anything via this way. All you need is a blank CD/DVD or USB Flash drive(also pen drive etc) and follow the following instruction. Tip One: Hack Windows Vista Password Using A Free Password Reset Disk. This is a free and easy way to hack Windows Vista without data lost. The problem with this option is that you have to create the reset disk before the password is lost. Thus if you don’t have a password reset disk, this option is not for you. Here are the steps if you have reset disk. Step 1. Insert Vista password reset disk to your computer. Step 2. When you entering a wrong password for login, a hint will appear: The user name or password is incorrect. Click OK and back to the login Window. Click Reset password. Step 3. Password reset wizard is running. On the Welcome screen, click Next. Step 4. Choose your USB flash drive in the drop-down menu and click Next. Step 5. After the Password Reset Wizard finished reading your saved password, you need to type a new password in the Type a new password box and confirm. And then Click Next, then Finish. It is OK. Tip One: Hacking Windows Vista Login Password with Password Recovery Program. By using a Windows password recovery program, hacking Windows Vista password becomes easy. Loading a Windows password recovery program and burn it to a CD/DVD/USB on another computer. Use the burned CD/DVD/USB to boot your Vista computer and then you can remove any user account password. Hacking Vista is so easy. Purchase Windows Password Rescuer Personal Full Version, and then you will receive an email with full download link and licence code. 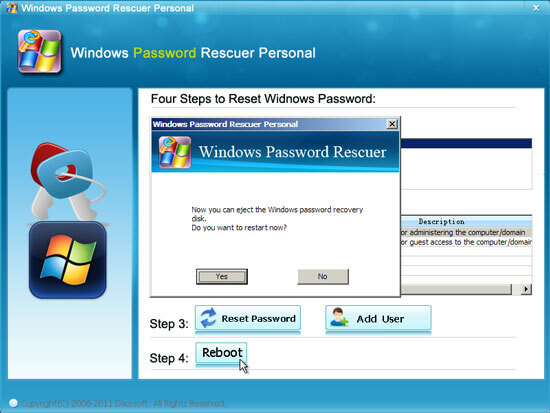 Step 1: Download and install "Windows Password Rescuer Personal" on any "accessible computer". 1. Run the software to create a bootable disk. Insert a blank CD/DVD or USB flash drive, choose the right media type. 2. Select the drive name which you inserted, click Begin Burning to start burning. After successfully complete burning. Take out the disk and use it to hack Windows Vista admin password. Step 2: Hack Windows Vista administrator password by resetting its password. Before this, please set your locked computer to boot from the bootable disk. In another word, you need to change devices boot priority on BIOS Table. You can follow these examples. How to boot from CD/DVD-ROM. How to boot from USB drive. When you save the new setup, your computer will restart automatically and boot from your disk. 1. When the following screen appears, select Administrator. 2. Click Reset Password, when a confirm message pops up, click Yes. Administrator password will be removed and show blank. 3. Click Reboot, remove your disk, then restart your computer and you can login Vista administrator without password. An all-in-one password recovery tool which can recover passwords for Windows, Excel, Word, Access, PowerPoint, Outlook, RAR/WinRAR, ZIP/WinZIP, PDF etc. The fastest way to remove Microsoft Word and Excel password. 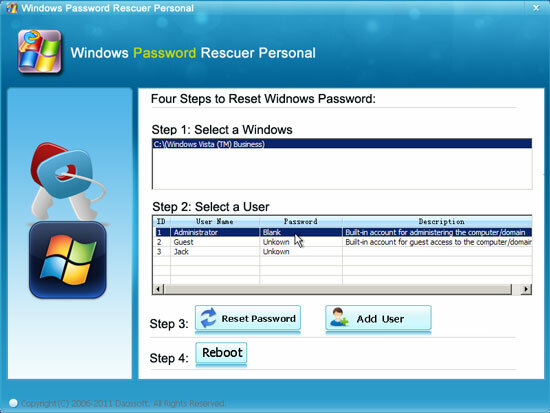 Compare to Word or Excel Password Recovery Tool, this software is using another method, Removing Password.